For those of us used to attending exhibitions, The Other Art Fair is a completely different experience. Say goodbye to wondering aimlessly around a stark and silent gallery space, and say hello to the friendly artist standing in front of their work, happy to chat about their inspirations and processes. We enjoyed conversations with Annie Clay who’s use of pastel colours to depict industrial scenes created an innovative contrast between hue and subject, and Ulla Maria Johanson who described her personal artistic process of producing a new small abstract painting every day and sharing it on her blog. But remember, it’s a two-way process, so it’s not just about being told what inspired each art work – the creators are keen to hear your feedback and interpretations too. We noticed Native American themes in Kevin Stamper’s abstract wooden wall hangings – their geometric colourful patterns reminiscent of traditional American quilts – yet he went on to explain how certain works were intended as cubic depictions of landscapes, such as a view of Cat Bells mountain in the Lake District. The other difference between The Other Art Fair and your average exhibition is that there’s an entirely different purpose for you being there. You’re not just expected to ponder and peruse, you’re given the chance to buy your favourite art works as well! This results in less lengthy descriptions inciting academic epiphanies like many galleries, and instead invites you to make decisions upon work based on aesthetic appearance – what would you like to see in your home above your mantelpiece? This being said, there is still an array of thought provoking, political work on offer. For example, there’s Zizi Rincolisky’s Trumpf project, which is a series of sculptures interpreting lines from Donald Trump’s speeches, as well as Ming Lu’s Whimsical Echoes of a Prehistoric Fertility Cult sculptures with phallic depictions, which we’re sure are anti-patriarchal statements. You don’t have to be looking to invest in art to enjoy The Other Art Fair; as well as the art on display there are plenty of activities to get involved in. Pick up a beverage from the oh so hipster Gin Caravan, and grab some food from Pinkman’s Bakery pop-up – we recommend the deliciously filling chicken and chick pea tagine –whilst you listen to DJs from BCfm 93.2 Radio provide the soundtrack for the night. 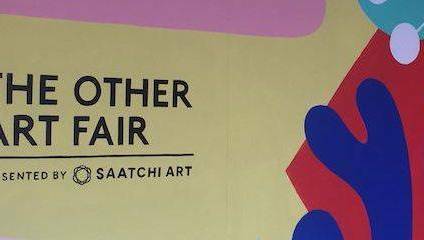 There are also a series of arty talks in the Saatchi Art Lounge over the weekend to get you philosophising, with subjects ranging from Women in the Art World to Investing in Art for £1000 and under. For something a bit less serious, get involved in the creativity by colouring in a feline friend on the Kitten Colouring Wall, or even get turned into art yourself, by getting a free caricature portrait drawn by recent illustration graduate Molly Fairhurst. Image Credit: Emily May. Portrait drawn by Molly Fairhurst. The Other Art Fair runs until 29 July at The Passenger Shed, Station Approach, Bristol, BS1 6QH. There is also an upcoming fair from 4-7 October at Victoria House, Southampton Row, London, WC1A 2QP.